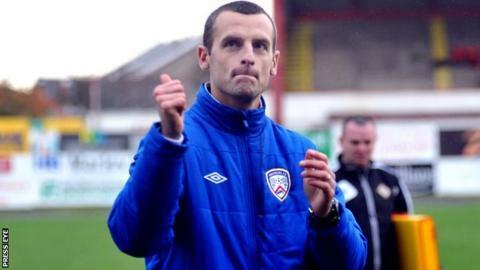 Oran Kearney hopes his seventh-placed Coleraine side can build on last week's 2-0 win over Cliftonville when they take on Glenavon at Mourneview Park. That success ended a run of three league defeats for the Bannsiders. "This time last year was probably a time I'd rather forget in terms of being near the bottom of the table and all that goes with that," said Kearney. "I don't want our young players to be burdened with that - it allows them to go out and put on good performances." Meanwhile three consecutive victories have seen Linfield move up to second place in the league table as they prepare to entertain Ballinamallard United. Michael McNamee presents coverage of Saturday's Irish Premiership action on Sportsound from 14:00 GMT on BBC Radio Ulster. Joel Taggart and David Jeffrey will be at the Showgrounds to watch Ballymena United play Crusaders while Michael Hammond and Lindsay McKeown are at Solitude for Cliftonville against Institute. The programme will provide coverage of the rest of the day's matches, plus news of the rest of the sport from Northern Ireland and further afield. "We're sitting in a very good position with a new team - we have a good bunch of boys who have bought into what I want to do," said Blues' manager Warren Feeney. Ballinamallard United boss Whitey Anderson wants to see an improvement in his side's form on the road as their away days have yielded just five points from a possible 30 so far during this campaign. "I can't work out what we are doing wrong away from home," admitted Anderson after his side's defeat by Glentoran at the Oval last week. "Our games at Glentoran and Ballymena were both lost by half-time - I can't put my finger on it, maybe it's a mental thing but it's something I have to look at. "It's something we are going to have to change - at Ferney Park we seem to get the crowd behind us, it's a good pitch and there's a good buzz. "In our first season in the Premiership our away form was excellent, probably one of the best in the League, but at the present time we are having a serious problem with it, there's no doubt about that." Elsewhere, leaders Cliftonville hope to bounce back from last week's setback when they host 10th-placed Institute at Solitude. Ballymena United have Davy Munster available again after serving a one-match ban, while their opponents Crusaders will try to recover from a poor run of form which has seen them lose to Portadown and draw with Institute in the Premiership and go out of the League Cup to Bangor at the semi-final stage. Dungannon Swifts, who have won two and drawn one of their last four games, are at home to Glentoran, who have lost just two of their last eight league outings.